Dialysis is the commonly practiced treatment for renal failure. The dialysis machine, also known as dialyzer works as an artificial kidney. When dialysis is being performed, your blood stream is accessed and different access points are created in your body, all so that your blood can be passed through the dialyzer for purification. What is a Bloodstream Access Point? A bloodstream access point is an entranceway created in your body in order to access your bloodstream. The access is usually created in your arm. However, in certain cases, it is also created in your neck or leg. 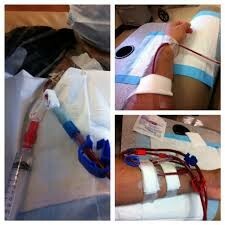 This is so your blood can be easily removed and returned to your body while the dialysis is still being performed. Why is there a Need for Creating a Dialysis Access Points? When your kidneys become unable to cleanse your blood of all the waste products, then toxic substances begin accumulating in your blood and put you at the risk of acquiring numerous severe disorders. In such a case, it is imperative to make a dialysis access point in your body so that you can be administered the hemodialysis treatment. Unless and until your bloodstream is accessed, you cannot undergo this treatment. What are the Different Kinds of Bloodstream Access Points? There exist three broad kinds of bloodstream access points: grafts, catheters and fistulae. Among these three types, a fistula is the most popular and commonly used type of bloodstream access point. While making a fistula, a vein and artery in your arm are joined beneath your skin with the help of a small surgical procedure. The chances of getting a blood clot or various infections are quite minimal in a fistula; hence, it is considered to be the safest choice of bloodstream access in order to carry out dialysis. A fistula can last for a very long time, even over ten years in most cases. People who have extremely small veins are not eligible for getting a fistula in their arm. In these cases, arteriovenous grafts are placed under their skin. An AV graft, which is also referred to as AVG, is an artificial tube containing plastic or some other material, which could even be a cow’s artery. This tube is inserted under your skin to connect a vein with an artery. To perform this procedure, you are normally given a combination of sedative and local anesthesia. AVGs can last for several years as well, but the risk of getting infections and blood clots is higher in AVG than fistula. In case you have a problem with a graft or fistula, or are suffering from kidney failure, then you are advised to use a catheter for dialysis. A catheter is a thin and soft tube that is placed in a big vein in your neck, leg area close to your groin or your chest. It is a permanent solution, but it can easily become infected, clogged, or dislodged. If any of these issues do take place, an everlasting portal will be created under your skin. How Does a Bloodstream Access Point Work? In grafts and fistulas, the connection established between your vein and artery helps in increasing the flow of blood via your vein. This causes your vein to stretch and strengthen, resulting in a higher amount of blood to easily flow through your vein. This increases the efficiency of your dialysis treatment. After a few weeks of your fistula surgery, it starts maturing. The size of your vein increases and it begins looking a big cord beneath your skin. After it has completely matured, a fistula is strong and large enough for the nurse or technician treating you to insert the dialysis needle in your body easily. If the fistula is unable to mature properly, you need to get another fistula. Normally, the chances of you experiencing any complication during and after getting a dialysis access surgery are quite less. However, in certain cases, you may undergo some problems. The two major problems associated with this surgery are infections and blood clotting. At times, your fistula or your graft can become infected, which can cause itching and lots of problems. In case you acquire infection, your dialysis access would have to be removed surgically. Once that access is removed, a fresh access will be created in any other area of your body. In the second case, if you experience blood clotting, the graft or fistula is fixed via a surgical procedure in your body. This procedure is known as thrombectomy. During this procedure, the fistula or graft is opened to get rid of clots with the help of a catheter. Whenever you are recommended to get dialysis by your healthcare provider, make sure to discuss all these access points with them. Also, you must review the benefits, risks and possible solutions with the healthcare provider, just so that you can decide which one is the most appropriate choice for you.